This film is about a handsome young man who divides his time between a woman and a man. It is beautifully realized by John Schlesinger in the most unemphatic way - nothing is pushed or lingered over. It just happens with little or no explanation. How do you explain a young man's sexual attraction to two decidedly older people with whom he has nothing in common? It's a "mystery" that remains a "mystery". The film does seem tipped in the older man's direction. Despite the fact that he is older - and would probably have a partner by this time - he seems genuinely happy. The older woman doesn't seem as happy and even sleeps with one of her clients. As I said, what happens in this film simply washes over you. Nobody is coming up with an over-all and convincing explanation. 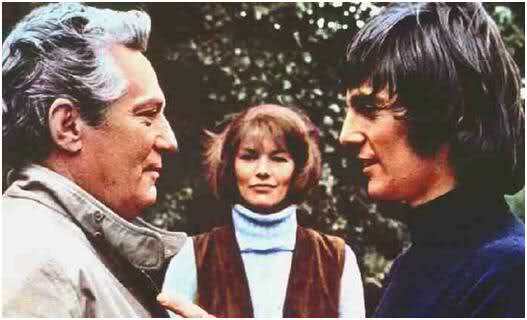 The actors - Peter Finch, Glenda Jackson and Murray Head - are quite convincing - and quite attractive, too. The direction is superb throughout and tells its' complicated story simply. If you want an explanation, you will have to go elsewhere. The mysteries of the heart are mysterious indeed. In the end, the young man, Bob Elkin, leaves for America in the hope of promoting one of his artistic projects. Alex Greville (Glenda Jackson) and Daniel Hirsch (Peter Finch) take it in stride. Daniel Hirsch gives his famous monologue at the end to the camera in which he tell us that Bob wasn't the man that he had been looking for, but - "we were something". You are left with your own answer. What would Daniel and Alex say? That they lost a lover, a friend, a diversion? Schlesinger is merely returning to his British roots where it is "business as usual". Midnight Cowboy showcased how the Yanks deal with all of this mysterious same gender attraction situation: everybody is slinking into movie theaters with rocket-ships on screen symbolizing stuff we are not permitted to see on screen, Joe must defend John Wayne being a "cowboy" and a devoutly religious sixty-something business man is thankful he stays "good" after taking Joe to his hotel... only to get strangled by Joe with a phone. Oh... and Joe only hugs Rico after he is dead on the bus. Yet the Brits are... well, it is legal now and nobody is persecuted anymore and we have all gotten used to Oscar Wilde, so... whatever. Let's move on. Again, I was watching Four Weddings And A Funeral for the umpteenth time and trying to think of any mainstream American rom-com filmed in 1993 that featured a gay couple among The Friends, even if they were associated more with The Funeral than The Weddings. Yet the only ones I can think of from that era are either "indies" made by gay filmmakers exclusively for LGBT film festivals or a star vehicle with Tom Hanks dying of AIDS. In Mike Newell's world, a gay couple are just another part of the population and nobody is gayer than Simon Callow bellowing "It's bloody Brigadoon!" before he collapses. "Sunday Bloody Sunday" was a very courageous film. Homosexual acts were decriminalized in England in 1967. The film was released in 1971. This film has it's merits, but there are many WEIRD things that just do not "translate" to general entertainment, bless John Schlesinger's heart. LOTS of moments (and characters) that are hard for the audience to grasp. 1) Glenda Jackson seems to be a loser in love for many years past, and her attitude is one of a loser. Fine, but I don't want to watch that the entire film. Even if the dreamy-looking guy in need of a haircut wasn't GAY, he's way too young to be dating Glenda Jackson anyway. 2) An adorable young girl has the family dog VIOLENTLY KILLED for dramatic effect, and then giggles about it. What in the world is THIS gut-wrenching, horrifying scene in aide of? To make Glenda Jackson thankful she has no children? To say that even if the child is giggling over the violent death of a pet, they're still so cute (because they're British?) that we must watch such a scene in a film, and to make Glenda Jackson desperately wish for such adorable/sadistic kids of her own? Is this scene designed to outrage the British public watching the film? To wake them up? To insult them? Or because we watched this film, it's just a nightmare the world has to suffer in order to appreciate Schlesinger's "art"? Yes, Murray Head is much too young to be dating Glenda Jackson or Peter Finch. Unless, of course, he might be into older people who might take care of him. However, he is obviously a business enterpeuneur. He works with a team of three co-workers. I would guess that he doesn't need Daniel or Alec to take care of him. As to your second point, the little girl is clearly upset over the death of her dog - and the dog's death was obviously accidental. When Alec begins to yell at her, the little girl runs away in tears. She knows that she was wrong to run with the dog into the road where there was obvious traffic. She's a very intelligent little girl and already know that she was acting stupidly. However, her parents have promised her a new dog so as to wash the grief of the incident away. I don't think that kid was upset. I think she was thrilled to death to get attention. It was horrifying scene (in any movie, for any reason). When you torture an audience like this there should be a reason. I don't see anything anywhere in SUNDAY BLOODY SUNDAY's story that justifies or explains this scene----especially in a BRITISH film. Mistreatment of DOGS (and that includes MURDER of the family pet by running it into traffic) is something that British people in particular find unforgiveable. I don't know about EVERY country's attitude to this, but I think i can state the director is TORTURING his audience, perhaps for fun. Why? I can't guess. This film stinks worse than Glenda Jackson's smoker's breath.